Watching the pre-market news yesterday morning, I couldn’t help but be shocked by the losses recorded around the world. I was even taken aback by the stock market futures, which had forecasted a loss on the Dow Industrial Average of over 300 points when the market opened yesterday morning. I know there are problems in the world – and I’m well aware of the issues in Europe – but, as I have pointed out many times before, stock prices are determined on profits and economic reality, not hype by the financial media or the guys on Wall Street. By the time the market closed yesterday, the market had recovered close to 300 points. The Dow closed down only 25 points, the S&P 500 index wound up actually being up for the day. I suppose any day close to 300 points are recovered in one trading day is not such a bad day. This just goes to show that the Wall Street traders live by a different set of rules. They sell in the morning and buy in the afternoon, and if they’ve made half a point, then they’re happy. As long-term investors, we need to ignore those actions and count on firm economic results to generate profits. I want to discuss some of the issues the world is facing today and the potential corresponding impact on stock market performance. First, it seems that North Korea has decided to no longer deal at all with South Korea. North Korea torpedoed and sunk one of South Korea’s patrol boats, but apparently it’s the only country in the world that doesn’t understand why South Korea would like to be reimbursed for the cost of the destroyed vessel. Confusingly, however, North Korea decided it would be better to take their football and go home rather than continue to cooperate with South Korea by pulling out of their existing non-aggression treaty. So the question is how this will affect the stock market. It’s important to understand that North Korea is in economic isolation. It has almost no natural resources and it cannot even feed its population without the assistance of China or humanitarian efforts. North Korea’s budget is almost entirely allocated to its military programs. Wouldn’t it be more beneficial to the North Koreans if their government used its economic resources to feed the public rather than create additional military armaments? In the end, North Korea will do whatever China tells it to do. If China tells North Korea to make peace with South Korea, they will have no choice but to do so. But to believe that North Korea is a military risk to that part of the world borders on the absurd. For these actions to create a worldwide stock market sell-off is ridiculous. Likewise, and as I have discussed in previous posts, there is a question as to whether the debt situation in Greece will endanger the global economy. While it’s true that this situation will create a significant hardship on the Greek population, the fear of that spreading to the United States has been minimized by the recent actions of the European Union (“EU”) to guarantee the debts of its member countries. The Greek labor costs should enlighten you as to their problems. The national collective labor agreement in Greece provides for annual salary increases from 5% to 7% per year since 2000. The average increase in productivity during the same time was only 2%. Therefore, since 2000, the Greek economy has become more and more inefficient. In effect, the cost of labor has out-priced its ability to compete in international commerce, and therefore, the Greek economy has suffered immensely. These are the same workers who received large increases in salaries throughout this period without increasing their productivity and are now being required to take salary decreases. It should be evident that the same group of laborers that benefited during the last decade should take the losses until the country gets back on stable ground. This is just good common sense. To give you a basis for comparison, the unit labor cost in Greece went up 33% during the last decade; Italy’s increased 30% and Spain’s increased 28%. Germany, a country very much dependent upon its exports, only increased 6% while the U.S.’s costs plummeted 27%. The U.S. decrease in costs is mainly due to better technology – using machines rather than people. It shouldn’t be too hard to see that Greece essentially has priced itself out of the international export market due to their unsustainable high labor costs. Any negative comparisons between the U.S. workers and the Greeks workers are just inaccurate. Did you know that in 1971, 11.1% of Greeks were 65 or older? In 2001, 17% of their population was over 65, and by the end of 2009, the population of over 65-year olds had increased to 18.7%. It’s now estimated that by 2031, 25% of all Greeks will be 65 or older. What makes this even more remarkable is that the average Greek retires before the age of 55. Young, skilled workers are leaving the country. As you can see, there are fewer and fewer workers supporting practically 25% of the entire population. This economic time bomb needed to be addressed; now it has been. So far, the month of May has been disastrous to the equity markets. The Dow is down 9.69% for the month, the NASDAQ is down 10.06%, and the S&P is down 9.53%. However, year-to-date, the Dow is only down 2.61%, the NASDAQ is down 1.22%, and the S&P is down 2.94%. We all hate to lose money, but a 10% correction in the markets could be expected at any time after almost a continuous run upward since March of 2009 of approximately 80% on the major market indices. In any event, I don’t think any of these losses should be exaggerated by investors who are looking for long-term yields and not short-term trades. The economic outlook for the United States is virtually unchanged, even with all of this market volatility. Corporate earnings have been quite extraordinary through the first quarter of 2010 and there is nothing I see today that would change that outlook. Interest rates are unbelievably low, which stimulates the economy and makes purchasing of a house almost at its lowest level at any time in our financial history. Even though the situation regarding Greece will ultimately have some impact on the U.S. economy, it’s unlikely to have a large effect. Many financial experts are predicting the effect on GDP for 2011 due to the European financial mess at less than .25%. This is basically a rounding error. Since our exports to Greece are only 15% of our total exports, any reduction in trade with Europe will have little effect on our economy. There have been other factors that have negatively affected trading during the month of May. Traders seemed to be focused on Congress’s debate concerning financial reform. In the end, Congress created a bill that does virtually nothing – except make government bigger and increase taxes (again). It does nothing to attack the real problem. Congress these days seems to be like a hockey goalie, avoiding the puck at each shot. With this bill, they’ve only created another gigantic government bureaucracy that does nothing to prevent another financial collapse. Without a doubt, Freddie and Fannie were the start, middle and the end of the financial disaster of 2007 and 2008. Not a single provision of the current legislation does anything to deal with those issues. There are plenty of financial controls in place now; they just need to be enforced. I also believe the issue regarding the tremendous budget deficits is heavy on many traders’ minds. Everyone concurs that the deficits are unsustainable – they’re simply a bad omen for the future of this country. However, realistically, we cannot deal with the budget deficits until we’re absolutely positive the economy is on solid ground. We should have that assurance before the end of 2010. It will be impossible for Congress to raise taxes enough to balance the budget even though, unquestionably, they will try. Sooner or later, we must reduce the size of government in order to get government expenditures anywhere close to the revenue our government receives. Creating higher taxes to fund an inefficient and bloated government is wrong on every level. Therefore, I think it can be easily said that while these losses have been painful, they are certainly not unexpected and are certainly not something we would suggest you trade around when you a long-term investor. The combined total of our entire portfolio reflects a loss of about 2% for 2010 thus far. That loss can be overcome in one week’s trading. If the financial circumstances in the United States were to quickly change or deteriorate, I might reconsider my position. However, that hasn’t happened so far. Therefore, we believe the best course of action is to wait out this small correction and see which way the market trades when it’s over. We should certainly know within 30 days whether that is a further downward movement or one of recovery. As always, the foregoing comments are my opinions, thoughts and personal biases. In all cases, I could be wrong. 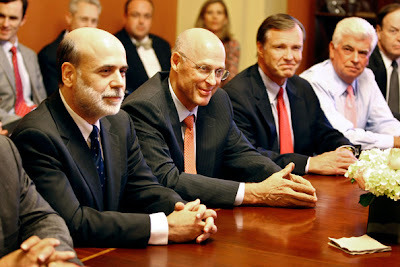 In September of 2008, I wrote a post entitled, “This is NOT a Bailout! !” At that time, the proposed plan to save the U.S. financial system was only three pages, and in my post I stated that it was more of a money-making venture than we were being led to believe by the financial press. After all, if you invest in assets, eventually those assets will provide a return. As we all know, the Troubled Asset Relief Program (“TARP”) became something completely different than what was originally proposed back in September of 2008. When it was thought that purchasing troubled assets from the banks was going to take too long and be too political, it was decided that direct investments into the major U.S. banks would be a quicker and more efficient way to complete the task. At that time, many editorialized that it was ridiculous for the federal government to be investing in the U.S. banks. In fact, many of the famous economists writing for the New York Times forecasted that all major U.S. banks would have to be nationalized in order to ever repay these investments. Boy, were they wrong! I argued in 2008 that the TARP had nothing to do with a bailout; rather, it had to do with stabilizing the economy and improving the financial stability of the U.S. markets. Approximately two years later, we now know that the “bailout” has been far less expensive than what was originally anticipated. It was forecasted last month that the TARP will have a projected loss of less than $89 billion, far less than earlier forecasts. Less than one year ago, the Congressional Budget Office and the Office of Management and Budget estimated that the bailout cost would be approximately $250 billion. Last month Secretary of the Treasury Timothy Geithner forecasted that the TARP investment loss would be no greater than 1% of GDP, approximately $140 billion. What’s so amazing about this percentage is that many government officials were forecasting losses on the TARP to be many times the cost of bailing out the savings and loan industries in the late 1980’s and early 1990’s. The total loss in those years was 3.2% of GDP as compared to the loss from the TARP likely being less than 1% of GDP. These projected losses are even more impressive when you consider that the TARP includes some investments that were clearly ill-advised. You may recall that at the end of the period, the federal government invested money in General Motors and Chrysler Corporation. Saving these companies was never a consideration when the TARP was originally designed. In my opinion, these investments were granted only to repay political favors; they had nothing to do with financial stabilization of the banking industry. The government has also invested over $145 billion in Fannie Mae and Freddie Mac. These two quasi-government agencies are just a black hole for losing money! While it is amazing that the U.S. congress has been discussing and debating financial reform for the banking industry and Wall Street for several months, not once has the reform of Fannie Mae and Freddie Mac ever been discussed. As recently as last month, the government waived all caps of financial aid to these troubled governmental agencies, which means they essentially have a blank check to continue losing money. Fannie and Freddie’s extraordinary ineptitude is truly fascinating. For the first quarter of 2010, Fannie reported a cool loss of $13 billion; Freddie was not far behind, losing $10.6 billion. Comparatively, for the first quarter of 2010, all of the banks and Wall Street firms that the government is trying to regulate reported sky-high profits. Isn’t it ironic that the government is trying to regulate businesses that are profitable and well-managed when it refuses to even consider regulating the two companies that were probably the source of the financial downturn in the first place? Fannie has already borrowed $75 billion and made a new request for $8.4 billion in additional government financing from the taxpayers. Freddie previously borrowed over $50 billion and is now seeking another $10.6 billion in financing. These guys just can’t seem to lose enough taxpayer money! Obviously, these organizations continue to lose money because they’re essentially an arm of congress that uses taxpayer money to subsidize congress’s pet projects regardless of whether or not they make economic sense. Yesterday, the senate had an opportunity to sever its financial ties to Fannie Mae and Freddie Mac. There was a bill before the senate that would have given Freddie and Fannie two years to wind down and sell off their loan portfolios. In other words, the bill proposed that the government get out of the mortgage business entirely and turn over mortgage lending back to where it belongs – the local banks. Unfortunately, the senate rejected the proposal 43 to 56, basically along party lines. There’s no way this congress will give up any opportunity to spend taxpayer dollars to accomplish their own political goals. Perhaps congress and the Obama administration need to be questioned as to why Freddie and Fannie aren’t included in their financial reform proposals the next time they complain that nothing is getting passed. I remind you of Congressman Barney Frank’s famous quote from 2003, “I want to roll the dice a little bit more in this situation towards subsidized housing.” Well, Congressman Frank sure did roll the dice – all at the taxpayers’ (yours and mine) expense. The original TARP proposal was designed to assist the banks; it was never designed to bail out car companies, and it was never designed to bail out Freddie and Fannie. The original three-page proposal that then Secretary of the Treasury Hank Paulson proposed to congress was to stabilize the banking industry and get lending started again in America. Nonetheless, less than two years later, we now know the result of the TARP. According to The Wall Street Journal, of the original $245 billion that the Treasury invested in the U.S. banks, $169 billion has already been returned to the Treasury. Furthermore, the U.S. government has collected approximately $13.7 billion in dividends, interest and other income, along with $4 billion that they earned in selling warrants they received with the original loans. The Treasury now forecasts that of the amount of money invested in the U.S. banks, the TARP will actually have an estimated eventual profit of $8 billion. Yes, after two years, I can finally say that my September, 2008 blog was correct – the TARP was NOT a bailout, it was a well-conceived program wherein the U.S. government made money on their short-term investment in order to stabilize the banking industry in America. Of the three major investments left, it is highly likely that American International Group (“AIG”) will be able to repay 100% of its loan to the Treasury within one year. This is a major accomplishment given that at one point, loans to AIG exceeded $100 billion. There is also a 50/50 chance that General Motors will repay their loan to the government once an IPO is completed on the sale of their stock. While there was a lot of publicity this month when GM agreed to repay their loan to the Treasury of $6.7 billion, there was almost no publicity that those funds were actually repaid with money that had been kept in an escrow account by the government and had never actually been loaned to GM in the first place. However, there continues to be approximately $35 billion invested in the common stock of GM that can only be cashed out when the government sells its stock in the open market to other investors. It’s also true that the Treasury invested $32 billion in the common stock of Citigroup, Inc. While there was great outrage among the public at the time regarding this investment, as of today that investment is worth approximately $6 billion more than the amount invested by the government. The only investment that appears to be a sure loser is Chrysler Corporation. Of course, we should never expect to receive the money from Freddie and Fannie; they continue to be a complete embarrassment to the government since they cannot control the losses and they cannot keep the politics out of those operations. The end result of the TARP is that it has been almost overwhelmingly successful and very useful in calming the financial markets during a very troubling time. Had we been able to keep the politicians from making the investments in GM, Chrysler, Freddie and Fannie, it is highly likely that the U.S. government would have made a major profit on the original TARP. In Washington, it seems that politics always controls financial decisions – usually to the detriment of the taxpayers. Almost every week I am asked to comment on the “bailout.” My comment remains that it wasn’t a bailout of the banks; rather, it was a bailout for the taxpayers. Be sure to let me know if you ever read about the success of the TARP anywhere other than here. I received many comments concerning my post on Friday regarding the credit crisis in Europe and its impact on the U.S. stock market last week. Today the markets that sold off 5% last week rallied 4%, which I believe underscores my point on Friday that the sell off on Thursday and Friday was related to technical trading and not economics in the U.S. I fully expect more volatility in the weeks ahead – but I don’t think that will change the improving economy in the U.S. Many of these traders apparently shorted the market on Thursday and Friday and got caught in their short positions over the weekend when the European Union approved the 750 billion euro bailout of sovereign debt in Europe. Fortunately, Rollins Financial neither bought nor sold during this period of time, and therefore, we simply suffered the ups and downs of the market, although it was still gut-wrenching to see the market selloff in such a dramatic fashion. However, when you invest for the long-term, which is what we do, you just have to accept the daily fluctuations; it’s the only way to enjoy the long-term financial gains. In my last post, I commented regarding the dangerous economic path that the United States is on and how it emulates the economies in Europe. Even though socialism has never worked economically in the history of the financial world, the United States is seemingly bound and determined to obtain that financial goal. As the economy in Greece has proven, without incentives for advancement, the government cannot raise the amount of taxes necessary to support all of the social causes that a socialistic economy desires. The essential difference between a socialist and a capitalist economy is that a socialist economy depends upon the government to provide many of the services that the private sector would provide in a capitalist economy. "Public spending by federal, state and local government was 24% of the GDP in 1950, 35% before the Great Recession, and could hit 44% this year." Clearly, public spending in all aspects of America is growing exponentially. As more and more of our GDP is run through the government, everyone will have to pay a lot more in taxes to support a larger and larger government – both federal and state. "The Tax Foundation estimates that 60% of all Americans now receive more in income benefits from government than they pay into government, and that with new policy directions, the number will grow closer to 70%." This is an interesting statistic. When the 70% level is reached, then seven out of every 10 Americans will receive more from the government than they have paid in. Arguably, there is no equality in taxation when such a large portion of the population is taking more than they are paying. "The Tax Policy Center has found that while everyone is expected to pay payroll taxes, only 47% of American households now pay federal income taxes." The difficult part of this particular statistic is that when taxes are raised, only 50% of the population will be incurring the tax burden. The federal government is currently spending in the neighborhood of $4 trillion per year, but it is only raising $2 trillion in revenues from all sources. It is technically impossible for 50% of the population to make up the shortfall of taxes for the additional $2 trillion. The obvious solution is that, at some point, the government is going to have to dramatically reduce its federal expenditures. While it may be possible to get the federal budget down to $3 trillion, it is impossible to get taxes up to $4 trillion. "The European Union has agreed that it is dangerous for a country to allow its publicly held debt to exceed 60% of its GDP. The Congressional Budget Office says that the U.S. could hit 60% by the end of this year, and on its current course could hit 100% by 2020." It’s a scary thought that the federal deficit is ballooning in such a fashion that it could potentially hit 100% of the GDP by 2020. It’s true that for a few years during President Clinton’s administration, the federal budget was actually in a surplus. I vividly remember reading in Dr. Alan Greenspan’s book that it became a concern in the Department of Treasury as to how they would even spend the surpluses. It seems like we have moved light years away from that era. With the deficits that began in 2001 after the 9/11 terrorist attacks and the expanding wars in Iraq and Afghanistan, the deficits have exploded. Even though they were terrible under President George W. Bush, the current administration has quadrupled the size of the deficits. It should be fairly clear to all Americans that we cannot continue to run these deficits and we cannot raise taxes to balance the current budget. The only viable solution is to reduce expenses dramatically and reduce the size of government to fit the amount of taxes we can possibly raise. "Meanwhile, The Economist estimates that the federal government now employs a quarter of a million people to write and enforce regulations." The more I think about a quarter of a million people writing and enforcing regulations, the more it scares me. Two-hundred and fifty thousand people writing regulations every single day must produce an enormous amount of paper. Perhaps I could give President Obama some help in cutting the federal budget: Why don’t we just fire all of these people tomorrow? The real solution to the federal budget it getting the federal entitlements under control. It would be simple to make the Social Security system self-balancing and well-funded for the next 100 years. All it requires is someone with the political will to do so. Medicare and Medicaid are entirely different situations. At the current time, both of these programs are technically bankrupt and will not be anywhere close to self-funding anytime soon. At some point, the government must make the hard decisions when it comes to controlling these costs. Unfortunately, none of the new Healthcare Reform Act does anything to attack the costs of these programs. I have had several requests for blogs that I will be writing over the next week. One concerns how the TARP will actually repay the amounts expended by the government. Another request concerns the new taxes that will be raised under the Healthcare Reform Act. I have intentionally waited to write that post since it is still unclear as to exactly what tax rates will be in place beginning in 2011. There are fairly significant increases in taxes for people who make more than $200,000 beginning in 2011, and they increase even more dramatically in 2014. If you have a specific topic you would like for me to discuss, I’ll be more than happy to take a shot at it. As always, the foregoing comments are my opinions, thoughts and personal biases. In all cases, I could be wrong. While sitting in my office between 2:00 and 3:00 yesterday afternoon, I was reminded of those traumatic days during 2007 and 2008 when the stock market was plummeting. Even though I knew perfectly well that the U.S. economy did not support the ridiculous sell-off on Wall Street yesterday, I can’t say I was particularly at ease as I watched the Dow tumble almost 1,000 points in a matter of minutes. But, as we’ve since discovered, the DJIA went from -100 to -980 in less than 15 minutes due to a serious case of broker digit obesity. D’oh! Suffice it to say that I received emails from clients at the same pace the market was dropping; I actually got a little concerned that my computer would short out from all the email activity! But I do understand why everyone was so concerned, especially since the activity wasn’t making any sense economically. Just this past Tuesday, I wrote a post stating that the economy was on an even keel with low interest rates and earnings being quite spectacular – the perfect recipe for higher stock prices. Since that post, the Dow Jones Industrial Average has fallen approximately 5% in the intervening three days. And so, I can certainly understand why my clients would question such a large and unexplained move in the national averages yesterday. According to CNBC, a trader at CitiGroup suffered a serious case of “fat finger syndrome” yesterday when he entered a “b” for billion instead of an “m” for million in a trade involving Procter & Gamble, a component in the Dow. At approximately $60 per share, a $16 billion share trade almost constitutes the entire value of the U.S. stock market combined. This mistake is said to have caused the brief nose-dive in the market – and the DJIA’s largest one-day point drop in its entire history. The market did recover from the nearly 990 low-point drop, with the major indices closing down a little over 3% for the day. To show just how crazy yesterday’s stock market activity was, Accenture Plc’s stock, which typically sells for approximately $40 a share, could be purchased for a single penny at one point between 2:00 and 3:00 p.m. It certainly seemed like the systems were all going haywire for that hour, but in the end, there should be no major consequences to investors as all of the trades from 2:00 until the closing bell that exceeded a certain threshold will be reversed and never recorded. In spite of that, yesterday’s wild ride left many investors feeling queasy. Another component of yesterday’s stock market performance concerns the financial crisis in Greece, although I don’t think the situation is as grave as is being reported by the financial news. First, it’s important to understand that Greece essentially has a socialized economy, under which the vast majority of its population is employed by the government. Greece’s retirement program defies any type of logic, providing a full pension to its citizens at retirement age. Furthermore, about 14% of Greece’s workforce works in job categories that the government deems hazardous enough to retire early – 50-years old for women and 55-years old for men (e.g., radio announcers fall into this category because their microphones expose them to germs). The average retirement age in Greece is 61, the lowest in Europe. Basically, Greece’s economy is totally out of control due to these unsustainable entitlement benefits. Germany did us all a great favor by telling Greece that in order for the Germans to spend their hard-earned Euros to bail out Greece due to their gross inefficiencies, they will be expected to clean up their act. German Chancellor Angela Merkel has imposed strict conditions that Greece balance its budget and learn to spend only money they have and not money they must borrow. What a novel concept! Washington, are you listening? Germany and France bowed their backs against the socialist Greece concept that the government will provide for all of its citizens’ needs from crib to grave. Greece really had no choice but to agree to Germany’s austerity moves; they would not receive the rescue package until they did. One of the items that set the sell off on Wall Street in motion was the riots in the streets of Greece concerning their debt woes. Proponents of Greece’s current system demonstrated to make known their dislike that they would actually need to take a reduction in pay and pension benefits. Seemingly, no one wants to be the one to sacrifice, but this is the tough medicine that Greece will need to swallow. An economy where the government provides all the benefits to its citizens must be converted to a more reasonable economy where employees are given incentives to create commerce and not become of ward of their country for years to come. As for the financial implications of a default by Greece, I think the financial press is suffering from a very slow news week to even make the assertion that it could devastate the world economy. Economically speaking, Greece is not exactly a financial powerhouse. Greece’s entire GDP for 2008 was $341 billion. 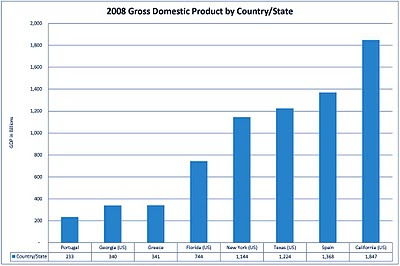 To put that in perspective, the 2008 GDP for California alone was $1.85 trillion – five times the amount of Greece. 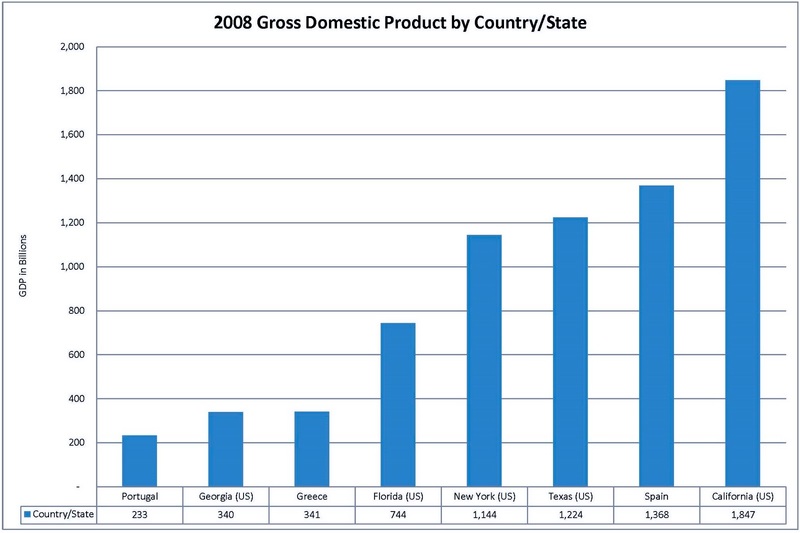 Texas had GDP in 2008 of $1.2 trillion, which is four times Greece’s GDP, and the State of Georgia’s GDP is almost exactly that of Greece at $340 billion. To imply that Greece’s economic troubles could become viral worldwide is the mother of all overstatements. Take a deep breath and think about this possibility. Could an almost financially insignificant country like Greece really create a worldwide crisis? Those who do not believe that Germany and France – along with the International Monetary Fund’s support (which is ultimately supported by the United States) – can bail out Greece, don’t understand the economic reality of this situation. In spite of the economic realities, we continue to hear that the contagions of Greece will also spread to Portugal and Spain. Reviewing the numbers, however, should give you some insight. According to the most current data from the Bureau of Economic Analysis, Greece’s GDP in 2008 was $341 billion. For that same year, Spain had a GDP of $1.368 trillion; and Portugal had a very small economy of $233 billion. The entire three countries together are not even the size of California’s GDP. There’s no question that if all three countries defaulted, it would bring financial pain. But would it bring worldwide financial chaos like what was suffered from 2008 through 2009? No way! That’s just ridiculous. Excellent employment numbers for the month of April were announced this morning. The U.S. economy added 290,000 jobs in April and they revised the March job numbers up an additional 230,000. Therefore, in these two months alone, the U.S. economy created close to 500,000 new jobs for out-of-work Americans. Once again, I do not write these posts in a vacuum. I completely understand that the U.S. is moving towards the same types of economies that have so often failed in Europe. Greece, Portugal and Spain are the latest examples of how a socialistic economy cannot function successfully. It’s impossible for the government to provide for every need of its citizens and continue to function in a growing economy. When the government is the provider of all financial benefits, then at some point everyone is treated the same. The guy that works hard and the guy that does not work at all receive the same benefits, and there’s something inherently wrong with that philosophy. Therefore, even though socialism is attractive on paper, in reality, it just doesn’t work. If no one has an incentive to do better in life, then everyone will do less. Greece is the most recent example of this. Will Portugal and Spain follow? As I’ve said before, the U.S. government’s efforts to introduce socialism into our economy will not be successful. For the reasons outlined above, introducing more social services into our economy puts us on a dangerous collision course that we cannot survive. I’ve been asked by several clients to discuss the states in our country that are on the verge of bankruptcy. California and New York have decided to create their own socialist economies inside the United States. California has a GDP of $1.85 trillion, and New York has a GDP of $1.4 trillion. The combined total of almost $3 trillion is a significant part of the $14 trillion U.S. economy. However, unlike the Euro zone, these states operate financially independent of one another based upon their own ability to run their state finances. In 2009, the federal government, under its economic stabilization plan, essentially provided income to these states to cover their deficits. From 2010 forward, that will not be the case. It’s true that California is technically already bankrupt. It’s been reported that due to their actuarial earning high interest rate on their state pension plan, the pension plan for California is $500 billion underfunded. At the rate they’re going now, California will have no ability to borrow money, nor will they have the ability to fund their deficits into the next fiscal year which begins in July. It was embarrassing enough to them last year that the state actually had to give out I.O.U.’s to pay their bills. This is just another example of an economy that was once great but by passing out entitlements to virtually all of their citizens, they can no longer afford their operations. California has almost the highest taxes in the United States and the most restrictive business environment. As illustrated many times, neither of these things work in growing an economy. Texas, on the other hand, has a GPD of $1.2 trillion, no state income taxes and a very favorable business environment. When the day comes that California and New York go to Washington begging for a bail out, we can only hope German Chancellor Merkel’s approach is used by our own federal government and only provide help when those states accept the economic reality that they cannot afford all of the socialistic give-aways that they’ve put into their economies. Once New York and California accept that people must work to receive benefits, then the federal government will help them. Hopefully, Washington will not give either state a dime until those austerities are put in place. Frankly, it’s not possible for any state in America to default. The U.S. government’s ability to finance even corrupt states like New York and New Jersey is bigger than the financial loss. I don’t think that either of these financially disastrous states will negatively impact our economy anytime in the foreseeable future. In summary, the U.S. economy is great, earnings are good and interest rates are low. That’s a prescription for higher stock prices regardless of how negative this week has appeared. 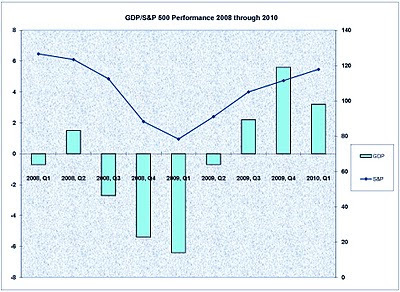 What Drives Stock Market Performance – the Economy or Corporate Earnings? Watching the news, I find it frustrating that what gets reported often bears little resemblance to the facts. There is a seemingly endless list of so-called experts who express that the current stock market performance is unsustainable since the economy has yet to recover. That statement is wrong in so many respects that hearing it has caused me to jump out of my chair in anger. First, to say that the current stock market performance cannot be maintained is incorrect because the economy has recovered. We’ve had almost four straight quarters of positive economic performance. Yes, I know that the 2nd quarter of 2009 had a marginal loss, but given how deep the recession was, that performance should actually be considered to be a positive. The GDP growth for the quarter ended March 31, 2010 is listed at a 3.2% increase. 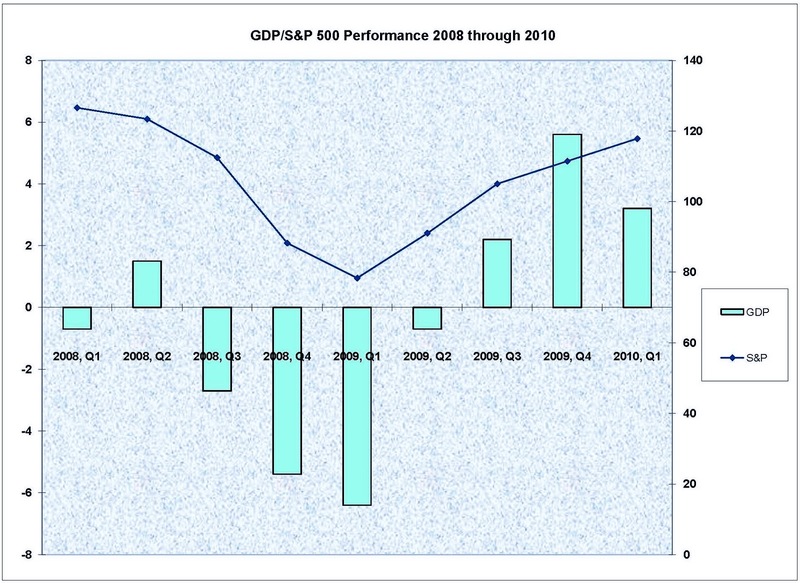 Therefore, we’ve had GDP growth of -0.7% in the 2nd quarter of 2009, a gain of 2.2% for the 3rd quarter of 2009, and a gain of 5.6% for the 4th quarter of 2009. Even though it has not officially been announced that the U.S. is out of the recession, it couldn’t be any clearer with last year’s positive economic GDP numbers that the recession is far behind us. The month of April came to a close this past Friday. For the week ended April 30, 2010, the loss on the Standard & Poor’s Index of 500 Stocks was 2.5% – but even that percentage must be put into perspective. Prior to last week, the S&P 500 had seven consecutive positive performance weeks, meaning that over the last eight weeks, only one was down; this reflects a fairly extraordinary performance of gains by anyone’s definition. Even though we had a few sell-off days in the week ended April 30, 2010, at mid-day today (Monday, May 3rd), the market is already up 1.3%. For the four months ended April 30th, the performance on the major market indices is nothing short of spectacular: the Dow Jones Industrial Average is up 6.4% while the S&P 500 is up 7.1% and the NASDAQ Composite is up 8.7%. These are all quite extraordinary gains especially when added to the market rally that began in March of 2009. The market gains for the first four months of 2010 are a result of the earnings of American corporations, which have been quite stunning. Many argued that the earnings could not be maintained since many of the earnings in 2008 and 2009 were created by cost savings. I have often wondered why the “experts” would make that comment. Once you cut costs, those costs remain cut until they are reintroduced. If there’s only a small increase in revenue, the profits will accelerate due to the reduced costs. Those who think that is a one-time cutting of costs really do not understand what it takes to run a business. With revenues accelerating and costs still low, earnings should be great for the rest of 2010. Many “experts” state that the stock market performance is not sustainable because, they argue, the economy is not responding. If you review the chart below, you will see the GDP numbers from the beginning of 2008 through the most recent quarter ended March 30, 2010. I have also embedded a line graph reflecting the S&P 500’s performance for the same timeframe based on the SPDR S&P 500 EFT. This is an exact reflection of the S&P 500 Index performance, including dividends over the relative time. It is fairly amazing to see that the line graph almost exactly equals the economy in the net change. It is often said that the stock market is a predictor of future economic performance, not a follower. Clearly, the stock market has predicted the upturn in the economy and has reflected in advance the turnaround. As you will recall, the S&P 500 Index bottomed on March 9, 2009 at 666. Today that same index reflects a value of 1,202. That’s almost an exact gain of 80% in a little over one year. In that same time period, the GDP has gone from a negative 6.2% all the way up to a 3.2% gain. Those who are stating that the stock market is not reflective of the underlying economy have not properly done their homework. What I find interesting about the rebound in the economy is that the government still has yet to spend a majority of the stimulus money approved in February of 2009. As you likely recall, most of the stimulus money wasn’t designed to actually be put into the economy until late 2010. It’s fairly clear at this point that the economy has already turned around and that the stimulus money will not be needed for that purpose. In fact, given the incredibly serious condition of the federal and state deficits, the government should return the rest of the stimulus money to the Treasury before it is spent. As we go forward, I do not anticipate an economy that becomes a runaway success. In fact, we should all hope that it is not that type of an economy. A GDP growth in the range of 2.5% to 4% would be perfect in keeping a “goldilocks” economy along with reasonable growth. Unless you are terribly disillusioned, you should not expect any significant increase in employment anytime soon. Corporate America has learned their lesson about cutting costs and they will not increase employment until they are faced with no other alternatives. Only when corporate America cannot get the work out with the number of employees they have will they actually seek and hire new employees. I don’t think we can count on that happening in 2010. There is a serious anti-business sentiment in Washington. With all the new regulations and new taxes they are putting on businesses, it is fairly clear that businesses will refuse to hire with those vast unknowns. With the passage of the health care reform bill, which creates a new gigantic federal bureaucracy and crippling taxes for most Americans, the last thing employers will want to do is hire new employees that will be subject to these types of taxes. Therefore, from a stock market perspective, we are in a fairly sweet spot. I do not expect a roaring economy going forward, but I do expect the economy to continue to be positive. With the incredibly low interest rates that we are seeing today, I would expect that the stock market would continue to move up somewhat between now and the end of 2010. I’m not trying to sound Pollyannaish; our economy certainly isn’t perfect. Obviously, our current federal government is spending double the amount of revenue they are taking in. It is impossible to cover that deficit with additional taxes. Sooner or later, fiscal responsibility will have to be implemented in Washington, D.C. When the current administration took office, they argued that deficit spending was necessary to improve the economy. They no longer have the luxury of that argument. With various European countries currently in technical default, I am reminded of the poor fiscal situation ongoing in many of our states. California and New York are technically bankrupt at the current time. Only states that have low taxes and friendly business environments are prospering while the states with high taxes and restrictive business policies are failing. Even a middle school student could see that the economic effects of higher taxes and restrictive business policies do not work in America. There will be a day soon when the federal government will have to bail out the states that have become buried in their own debt. To a state like Texas, which operates in a budget surplus, it is repulsive to send their dollars to Washington, D.C. to be used to bail out California which has practiced fiscal insanity. However, that’s where we are in America today. All of the problems concerning the budget, new taxes and foreign sovereignty debt are major issues. However, what drives stock prices is corporate earnings, and quite frankly, right now corporate earnings are extraordinary. As we move forward into 2011, we need to be well aware of all the issues of the world and we should all be enormously concerned with the new taxes coming out of Washington. However, as long as corporate earnings are great, stock prices will be stable or higher. That’s the exactly the environment I see ourselves in for the rest of 2010. On the subject of investing, I’m often amazed that people wait to fund their IRA’s instead of funding them as early as they are allowed to do so. Given the extraordinary stock market performance over the last 14 months, a lot of money was passed up by keeping it in low interest rate savings accounts instead of investing it in IRA’s or other investment accounts. I cannot tell you how many clients I have who have money in money market accounts earning next to nothing. Why this money is not invested will always be a mystery to me.